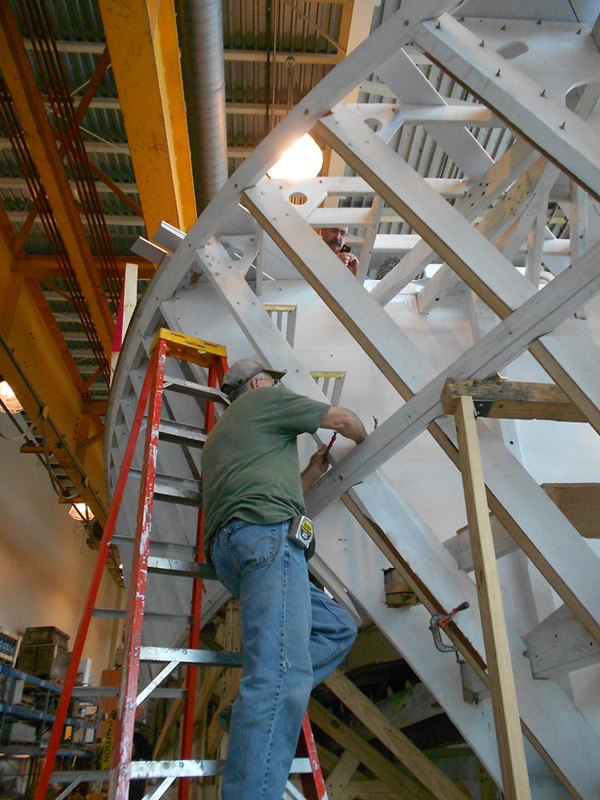 Frank works to fit pieces on the bow of PT-305. The covering board is fitted to the outside edges of the upper deck; it covers the ends of the deck beams and the tops of the side hull ribs. 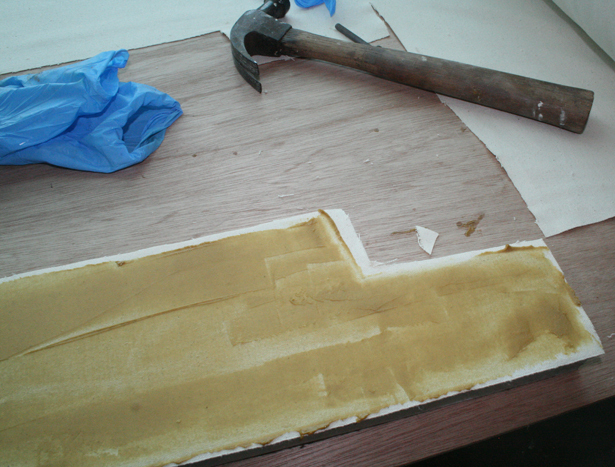 The covering board needs to be installed in order to install inner layer of planking. 3/8” mahogany strips are laid diagonally between the covering boards the full length of the deck, forming the inner layer of planking. The installation of the covering boards was taken care of by the weekday crewmembers Bruce, Doc, Mark and Louie. 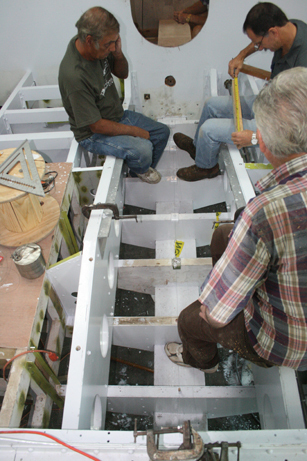 Bob Wade spent two weekends installing the Samson post and the engine cover hatch. The Samson post at the bow of the boat is as a hard point on the boat for tying off, usually the anchor line. Upon removing the original Samson post it was discovered that it could not be reused. A new Samson post was made out of solid oak, and the finished piece is roughly 5 inches square and about 12 feet tall, making it quite heavy. When installed, the post rests on the keel and is bolted to the crash bulkhead- the foreword most bulkhead that is meant to contain any damage from a collision. This completed the last major deck work before the task of laying the final layer of decking begins. 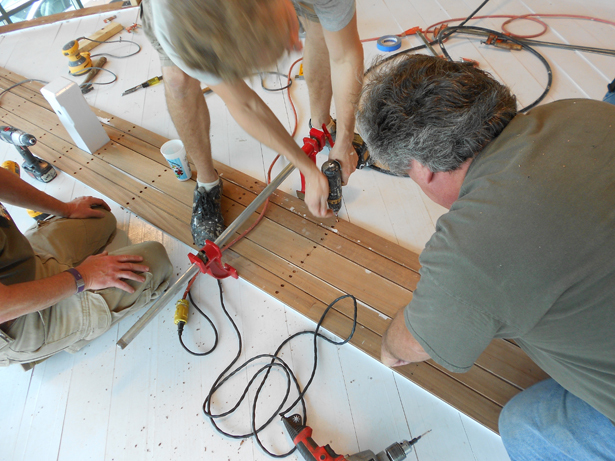 The crew is looking foreword to laying the decking, in order to get ready to drive the thousands of screws and copper rivets that hold everything together. This photo shows the Samson post and the construction of the forward part of PT-305. The square section to the right of the Samson post is a hatch that leads into the forepeak. There has been considerable progress in the engine room in the last few weeks. The first engine for PT-305 is almost 100% restored. A few weeks ago the gearbox arrived from off site restoration and Randy’s engine crew completed rebuilding the supercharger. Both of these assemblies have been installed on the completed engine block leaving one completed Packard 4M-2500. Work has begun on a testing stand for the engine to test the capabilities of the engines. With one engine nearing completion the engine crew has their work cut out for them, only two left. 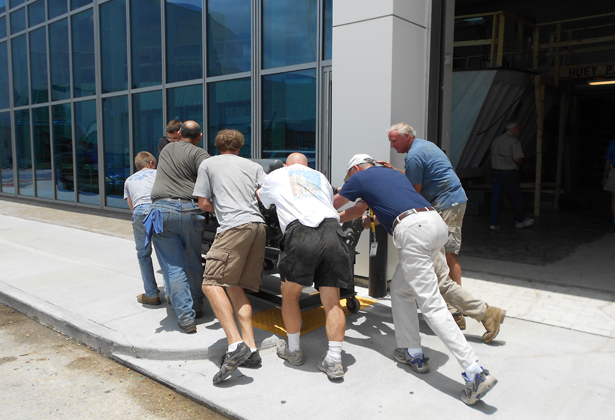 The 3500-pound engine takes quite a crew to move. After putting the engine the crew had been working on onto a different cradle, the engine had to be wheeled out of the main restoration space, and around the corner to get into the engine room. One of our "Rosies" on the job. Painting under PT-305 is the only time sitting down on the job is allowed! In order to allow further work in the engine room, Kali and Josh have been painting the lower section of the engine room. 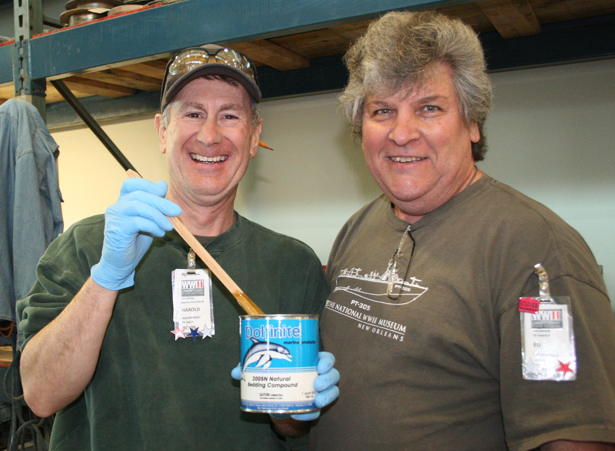 Painting PT-305 is an important part of the restoration, and all of the spaces within the boat are being painted by hand. The special marine paint used will help to keep water from seeping into the wood when the boat is in water. In the engine room this is especially important, as it takes a significant amount of stress, making it even more important that the wood remain dry and retain its integrity. Paint will also help the metal screws, bolts, rivets and supports from rusting, which can do significant damage to the wood, as the crew has seen during restoration. The engine room is an especially complicated area to paint, with all of the added supports for the engines. 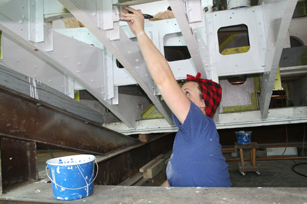 The bulkheads and deck ribs were painted in April with the help of a Navy crew, and with just one or two more Saturdays worth of painting left, the engine room is becoming bright white. Under the direction of Jimmy Dubuisson, Frank and Norm have been working hard on installing the emergency steering shaft for the rudders and beginning the work of installing the running gear for the center propeller shaft. The installation of the struts that support the center engine shaft is a very sensitive project. Specifications for PT boats call for the engine shaft to be within .0001 inch alignment with the engine. This means that the shaft needs to be perfectly straight in its support struts and the engine needs to be aligned on the same line the shaft is set in. If the engine and shaft are not put on the same “line” the result will be severe vibrations and shaking, which is detrimental to the operation of the boat. The beginning of the shaft installation process involved a stripped down engine block with a laser light. The laser is aligned with the crankshaft in the engine, which will occupy the same “line” as the propeller shaft. The block was mounted in the center line engine brackets in the engine room. The laser demonstrates the center point of the propeller shaft line, showing where the shaft will penetrate bulkheads and the keel. These preliminary measurements will be followed by weeks of debate and problem solving with the project leaders. More on this in the coming weeks. The propeller shafts are heavy and take quite a number of volunteers to move in and out of the boat as they work to align them. Photographs in this post are copyright of Jane Swaffield and Kali Martin. The time has finally come to re-deck PT-305. 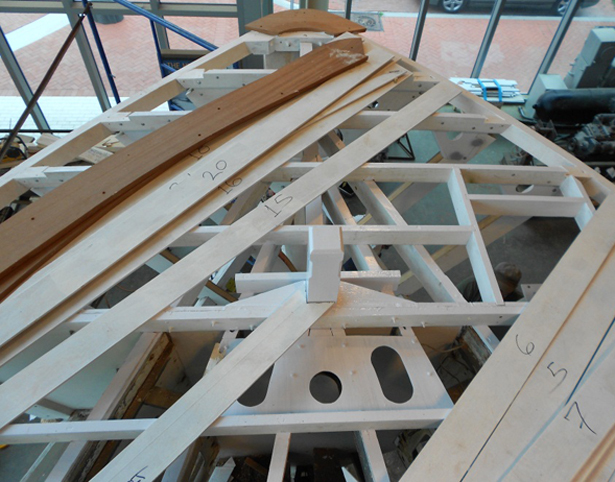 The sheer is in place, deck ribs are secure, the inner layer of planking laid, the covering boards are installed and some the ridiculous eighty-foot deck boards are ready for installation. Smiles are all around as the crew, for the first time, learns how to deck a Higgins PT boat. The groundwork for this moment was laid down back in 2009 when it was discovered that the deck of PT-305, and the ribs that supported it, were completely shot. Over sixty years of wear and tear had taken their toll on the construction. Deck ribs failed, screws corroded and planks rotted. This resulted in a very dangerous situation- any careless footstep on the deck would send a volunteer foot right through. Luckily the caution and vigilance of the crew has prevented any serious deck related mishap. The other major problem with the deterioration of the deck is structural. 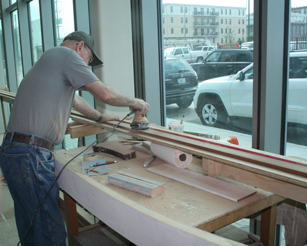 The planking of a wooden boat provides the majority of the strength in the completed vessel. A weak top deck would undermine the structural integrity of the boat while underway; therefore, if the deck was determined to be weak it would have to go. The crew’s worst fears were confirmed when the deck was removed. Hoping the ribs would still be intact and could be used, the deck was cut away around the ribs, only to reveal that the glue in the deck ribs had failed and the ribs had delaminated, effectively flattening the deck and rendering it structurally unsound. 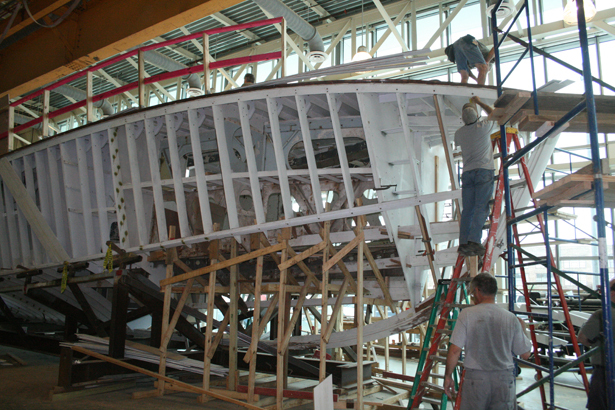 The ribs were removed and the process of replacing the deck began. 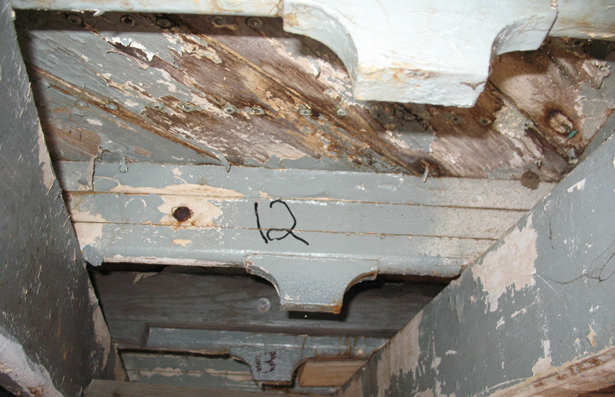 This 2008 photo of a deck rib and decking demonstrates the damage done to the original woodwork. Many measurements had to be made, sections of hull restored, debates started and material ordered before the deck was laid again. This is why it took until this Saturday to begin laying the final layer of decking. 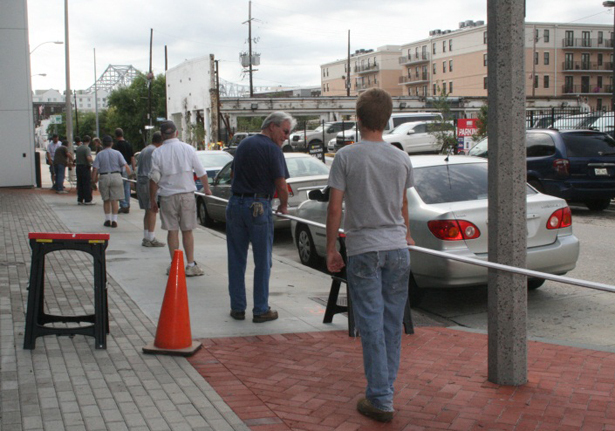 Due to the length of the deck boards, the crew has to route them using a special setup outside in order to create the rabbets. Over the last few weeks the inner layer of 3/” mahogany planking was laid in a diagonal pattern across the entire length of the deck. This inner layer rests directly on the deck ribs, meaning when you are inside of the boat this is the “roof”. While the inner layer was being laid, the covering board was completed and Doc began production of the top layer of deck boards. 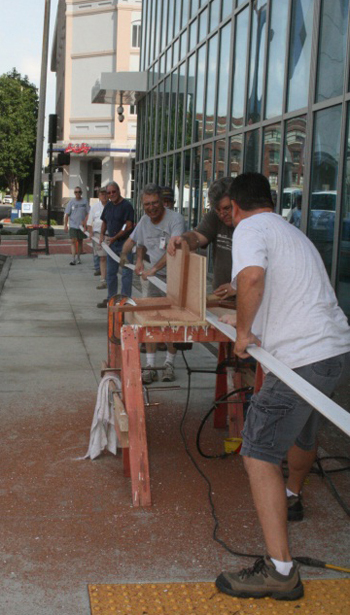 The top deck boards are 5/8” by 2 inch mahogany planks that are spliced together to create boards up to 80 feet long. The deck boards run fore to aft, the entire length of the boat, except for the center section that is interrupted by the chart house and engine room hatch. Each deck board has a rabbet cut in it on both sides for the full length. 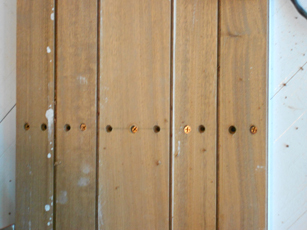 A rabbet is a groove cut in boards to accept and overlap other boards forming a tight seal or, in this case, it forms a groove between neighboring boards that will accept caulking. The completed deck will be one inch thick consisting of the inner 3/8” planking, one layer of Dolfinite, one layer of canvas, another layer of Dolfinite and the final top layer of 5/8” deck boards. The rabbets in the final deck boards will allow caulking between boards. This entire assembly is screwed to every deck rib and riveted together between every deck rib. Because we are just learning how to do this and there is not a war on that needs this boat, we are taking a slower approach to decking the boat. The entire deck will be put on dry, without the Dolfinite layers and canvas. Once the entire deck is fitted and “installed” it will be removed by section and “finished” installed with the canvas and Dolfinite. This is a good time to explain the wonderful substance that is Dolfinite. Dolfinite is a bedding compound used to waterproof joining layers of wood. It has many other uses, but in the case of PT-305, waterproofing is its main function. You can’t let the happy little dolphin on the front of the can lure you into a false sense of happiness. Its color is a mix of olive drab and puke green, and it has a smell of its own and a mind of its own. That happy little dolphin mocks you as this paste like substance sticks to anything and everything. It has single-handedly ruined clothes and tools for Higgins boat volunteers since 1997. “Dolfinite duty” is a dreaded volunteer assignment that is greeted with laughter and stories of what this substance has done to hair, clothes, emotions and tools. Plain and simple, it isn’t t fun to work with, but for some reason we always enjoy it. After 60 years some of the original Dolfinite is still moist, so this stuff works very well. When all is said and done we will have re-applied 200 gallons of Dolfinite to PT-305. This accounts for roughly 3,600 pounds of the finished weight of the boat. Volunteers Harold and Ed prepare to work with Dolfinite. In this photo you can see Dolfinite spread on top of canvas on a piece awaiting installation. Frank, Joey and Norman at work with their propeller shaft alignment setup. The shaft will pass above the keel (the board in the center) and run through the aft bulkhead of the engine room, eventually passing through the keel and out of the boat. The engine crew under Randy have one Packard 4M-2500 engine ready to go. The engine looks beautiful in the Packard colors matched from paint on original parts. Jim and Randy are working on mounting water pumps to the engines and finalizing plans for the test stand. One of the current engine stands will be converted to an engine test stand that will be able to sustain one idling engine for a few hours. Because of space restrictions within the engine room, Randy wants the engines thoroughly tested before they are installed. This will make quite a show in the parking lot next to the warehouse. Propeller shaft alignment was momentarily discussed in the last post, and this week the tedious process continued. Because the engines and shaft need to be in almost perfect alignment this process will take a while. One of the oldest shipyard methods for aligning a shaft and support struts is the method that the crew has used on the two landing craft we have restored, and is now being used on PT-305. 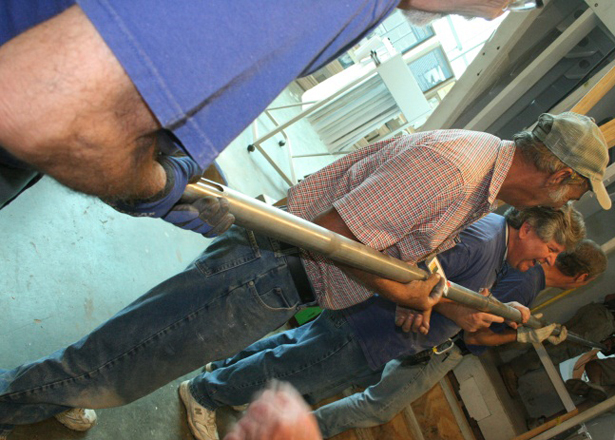 First, the angle of the shaft is determined. The starting and ending positions, the front of the engine and the propeller are established. Connecting these two points are a length of piano wire with a large weight attached to one end. This creates a perfect line, establishing a visual marker for all of the support struts, shaft holes and engine mounts to be measured off of. The support struts have round holes that the propeller shaft passes through. By mounting these struts with the piano wire centered in the middle of the shaft hole, a support system that will hold the shaft along this line is established, thereby creating a straight propeller shaft. This process is not as easy as it seems. It is very difficult to determine the starting and ending positions of the wire, the angle of the propeller shaft you want and centering the wire within the shaft struts. There is also one major catch, being a wooden boat, as soon as PT-305 is placed in the water the shape of the hull will change. The goal is to get it as close as possible in the warehouse to reduce the amount of tweaking required while the boat is in the water. Frank and crew can be seen on the right-hand side of this photo, hard at work on the bow of PT-305. Post by Josh Schick and Kali Martin. All photos copyright of Jane Swaffield and Kali Martin.